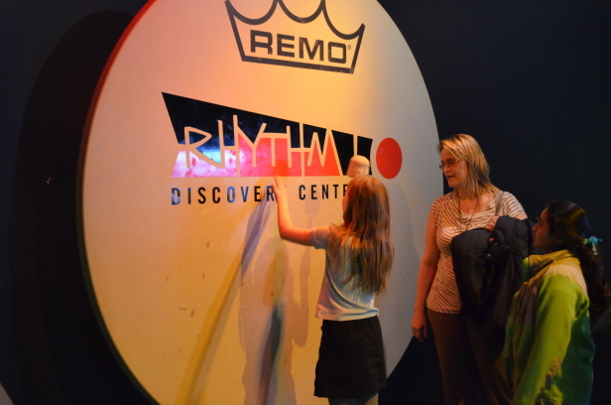 Schedule a tour at the Rhythm! 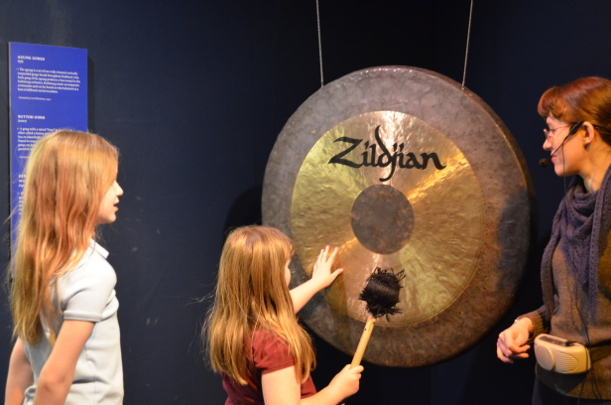 Discovery Center, Indianapolis’ best music education destination! 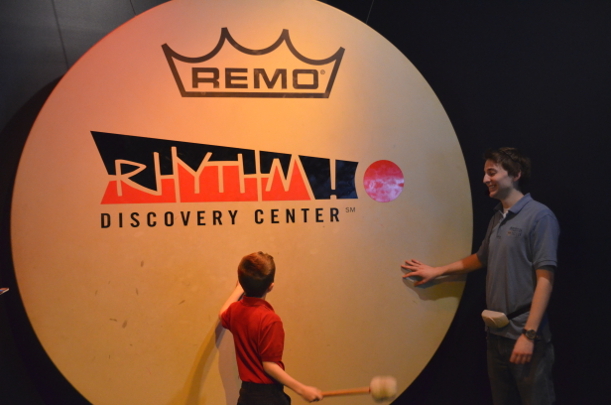 Each tour through our highly interactive exhibits is the perfect combination of education and entertainment. 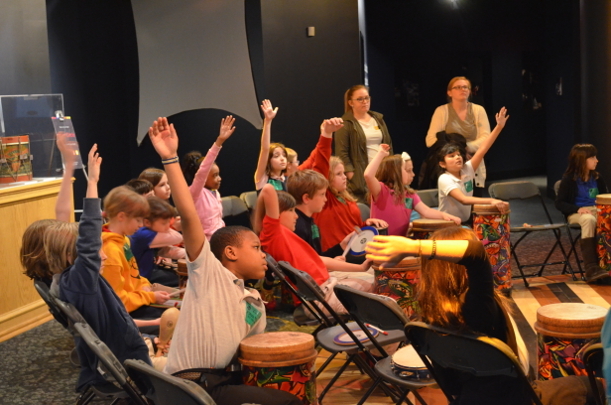 Rhythms and grooves together in a facilitated drum circle. How percussionists play many instruments in an orchestra, seeking out the perfect sound for each musical composition. Wood, skin, and metal percussion instruments in Time Tunnel, how has percussion shaped communication, music, art, performance and society? Tour Availability: 10:30 AM – 3:00 PM start time, Monday or Wednesday – Friday. Group size: Tour groups must have a minimum of ten attendees and a maximum of 50. For groups larger than 30, we may require attendees split into two groups and be led through the museum with two separate guides simultaneously. Groups larger than 50 can be accommodated with consecutive tour times. Customized Topics: Rhythm! tours are customized based on prior musical knowledge and age-range of attendees. Guided tours are suitable for preschoolers through highschoolers. 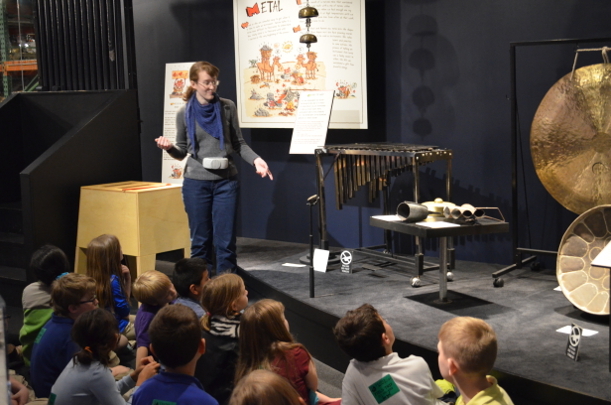 Topics discussed during the tour include the origins of instruments, percussion instrument construction and tuning, the physics of sound and how it applies to drums, and how percussion is used in popular music today. *Interested in scheduling an adult tour? Contact us at 317-275-9030 to discuss options and availability. Tour length: Tours are approximately one hour in length, including a 45-minute walking tour and a facilitated drum circle. Pricing: $6 per student, with a 5:1 free chaperone ratio. If you are a teacher at IPS, or a public school in Wayne, Washington, Warren, or Pike Township, please contact our Museum Manager to learn out about our grant-funded field trips. Booking: To book a tour or for additional questions, please contact our Museum Manager at (317) 275-9030 or rhythm@pas.org. Chaperones: Rhythm! requires that the school provide one chaperone for every 10 students. With every five purchased student tickets, a tour receives a free chaperone ticket. If more chaperones attend than the 5:1 ratio, they are admitted at a $6-per-chaperone rate. Accessibility: Rhythm! meets all Americans with Disabilities Act requirements for accessibility. Please notify the Museum Manager prior to your tour for any special-needs requests. Once your date and time have been selected and confirmed, Rhythm! Discovery Center will email your reservation confirmation and pre-visit materials. If you have questions, please contact the Museum Manager at (317) 275-9030 or rhythm@pas.org. Coupons may not be applied to a group tour rate.